These days, I find it incredibly difficult to shuffle through the darkness that seems to engulf the world around us. News stations and online media outlets scream of the despairing situation in which our country, and the world, has found itself. From mass school shootings and political uneasiness to the sexual-assault culture, it sometimes feels as though there is no end in sight. So many people are walking through brokenness. As we continue to stare into the vast darkness of our current situation, it is easy to feel that we can do nothing except walk away. Many experience a desolation that no words could begin to express. These moments of solemn reflection into the pain of our world and the heartache of other human beings often brings me to my knees. I am left feeling disheartened and discouraged. I question whether my passion for human beings and my pursuit of social justice are enough to impact the shattered world we live in. 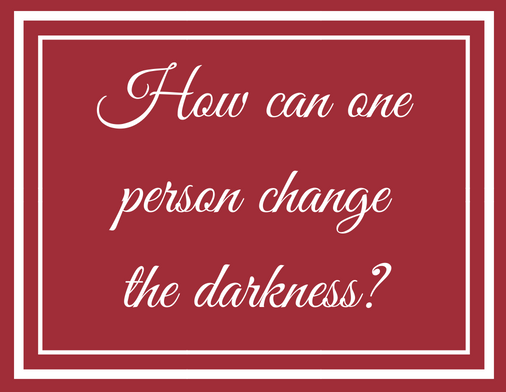 How can I, one person, change the darkness—and will my voice even be heard? It is so easy to want to run and hide from what is going on. In a world that fights hard to silence those who want to be beacons of light, the path of least resistance is to stay silent. 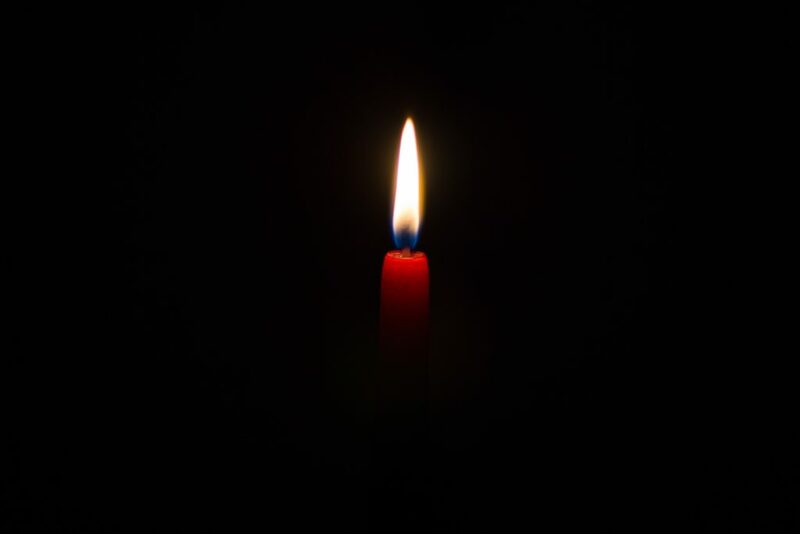 There have been times in my life when I received the gift of watching how light brought into a dark situation changed the atmosphere—when I experienced what it is like to have hope spoken into my own situations. Growing up, I struggled severely with mental-health issues and the pain that comes from the brokenness in the world around us. Some days required every ounce of energy and push that I had so I could make it to the next tomorrow. This became the story I lived every single day for over seven years. Each day brought questions: “Am I worth anything? Is this pain going to end? Am I alone in my fight?” As time continued and I got older, things started to shift and the pain slowly began to ease. I began throwing myself into school and work, attempting to prove to everyone around me that I was “worthy.” However, even time and my accomplishments would not completely erase the wounds that I had experienced, and I still wrestled with the many scars left by my past. This past year, that darkness began to resurface, and I experienced brokenness again. All the effort I had thrown into proving myself to those around me began to lose its power. My heart’s insecurities started to make me question whether I could ever have an impact on this world. Was there any way that someone as broken and riddled with pain as I was could speak light into the darkness? How could I even begin to think of trying to impact another person’s world when my own was falling apart at the seams? It was around this time, in February 2017, that I applied for entrance into a graduate counseling program at a local college, to which I was ultimately accepted. However, I allowed the fear of my own brokenness to stop me from pursuing that program. I told them that I could not start and would be deferring my acceptance. Fast forward a year to 2018. I started to get more involved at my local church and met a great couple whom I now call my second parents. While I was over at their house to watch the Super Bowl, I struck up a conversation with my “second dad,” who is now working as a counselor. It was through this conversation that he began to shine light into my darkness. He reminded me that it is broken people who can relate to the broken and hurting. Through this talk, I realized I did not have to be perfect to help change the world; I just had to be willing. I am happy and excited to say I will be starting my master’s degree in counseling in the fall. I do believe it was this one conversation that opened the door for the light to shine into my life. For the first time in years, I allowed that light to illuminate a hope I can cling to. It is easy to look around and forget that hope still exists and that it is worth fighting for. Don’t allow your brokenness or the silence of this world stop you from shouting into the abyss of pain. 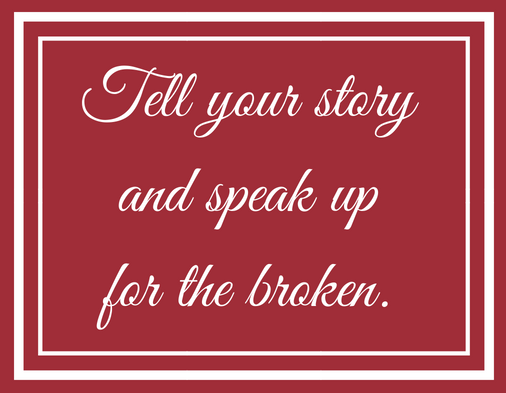 Tell your story and speak up for the broken. Do not fear, because you never know who may need your light to navigate through the darkness.